(Vienna, June 11, 2018) DNA Repair is essential for a healthy organism. In every day of our lives, tens of thousands of damages occur in the genetic material of our cells. Hence, it is not surprising that a broad variety of repair mechanisms developed in the course of evolution that enables cells to quickly react and patch up the affected DNA strands. How important those repair mechanisms are becomes obvious, when they fail: Patients with FA are unable to repair DNA crosslinks, which, besides numerous other symptoms including bone marrow failure, in most cases eventually leads to cancer. So far, no curative therapy has been found for this disease. Damaged DNA and its complex repair mechanisms is the research focus of the group of Joanna Loizou, Principal Investigator at CeMM Research Center for Molecular Medicine of the Austrian Academy of Sciences, and finding new molecular targets to fight FA is one of their goals. In their latest study, published in Nature Communications (DOI 10.1038/s41467-018-04649-z), the researchers aimed to find additional genes that genetically interact with the diseased FA genes and are essential for the manifestation of the disease, and thereby, if destroyed, restore the ability of the cell to repair DNA crosslinks. The research project was performed in collaboration with scientists from the University of Cambridge, from the Leiden University Medical Center, the University of California, the University of Toronto and the group of Jörg Menche at CeMM. The scientists, with CeMM PhD student Lydia Garcia-Robinson and former post doc of Loizou´s lab Georgia Velimezi as shared first authors, deployed a novel genetic screen to search for synthetic viable interactions, using a genome-wide loss-of-function approach that uses insertional mutagenesis achieved via a gene-trap approach, on special lines of FA-defective cells that only possess one copy of each gene. With this method, they scored a bulls eye: the researchers found an enzyme that removes ubiquitin, an important regulator of protein activity and half live, to be synthetic viable for FA gene deficiencies. 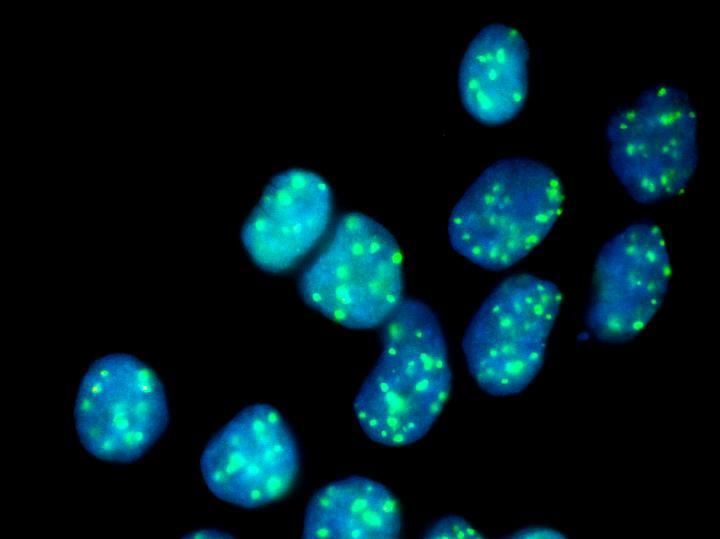 When the enzyme, called USP48, was artificially destroyed by CRISPR/Cas9, the FA-deficient cells were less sensitive to DNA-damaging compounds and showed an increased clearance of DNA damage. With further molecular analysis of the underlying processes, the researchers were able to show that the inactivation of USP48 in FA-deficient cells even restored a nearly error free repair of the damaged DNA. "Our results show that USP48 inactivation reduces chromosomal instability of FA-defective cells", Joanna Loizou explains. "This highlights a role for USP48 in controlling DNA repair and suggest it as a potential target that could be therapeutically exploited for Fanconi Anemia. To develop USP48 inhibitory molecules could be a new potential approach to alleviate the symptoms of FA patients". The study was funded by the European Molecular Biology Organization (EMBO), the Austrian Science Fund (FWF), the European Commission, the European Research Council (ERC), the National Institutes of Health (NIH), Cancer Research UK, the Wellcome Trust and the Boehringer Ingelheim Fund (BIF). The mission of CeMM Research Center for Molecular Medicine of the Austrian Academy of Sciences is to achieve maximum scientific innovation in molecular medicine to improve healthcare. At CeMM, an international and creative team of scientists and medical doctors pursues free-minded basic life science research in a large and vibrant hospital environment of outstanding medical tradition and practice. CeMM's research is based on post-genomic technologies and focuses on societally important diseases, such as immune disorders and infections, cancer and metabolic disorders. CeMM operates in a unique mode of super-cooperation, connecting biology with medicine, experiments with computation, discovery with translation, and science with society and the arts. The goal of CeMM is to pioneer the science that nurtures the precise, personalized, predictive and preventive medicine of the future. CeMM trains a modern blend of biomedical scientists and is located at the campus of the General Hospital and the Medical University of Vienna.